She Loves the Pubs in Dublin! Jonathan and I are in Ireland! To see our pictures, click here . Above the clouds, a blush rose in the cheeks of the Irish sky. It was early. A tailwind had pushed us almost half an hour ahead of schedule. After eleven hours on two separate planes (and one three-hour layover in Chicago), we were finally descending. The vast, marshmallow bank of creamy clouds swallowed our plane and before long we'd pushed through them and could see the blue black expanse of ocean water dotted by lights from fishing boats and lighthouses. Lower. Lower. Then we could see the rise of land out of the water... Ireland. It was bright enough to make out rolling green pastures divided by thick, dark hedgerows. Our plane touched down before 8:00 am. We disembarked on the tarmac and walked into the airport. This gave us the perfect chance to grab a photo op with our emerald Aer Lingus plane in what locals would call the wee hours of the morning. Just inside the terminal, we stepped away from the crowd and took turns in the bathroom... changing into fresh clothes, brushing our teeth and washing our faces. I'd been lucky enough to snag three hours of sleep on the flight over, but Jonathan hadn't been able to do the same. Customs didn't take long, and the attendant who stamped our passports found our "quick weekend trip" idea to be cute. He wished us luck and alerted us to the fact that this weekend is one of the Six Nations Rugby Championship weekends... and it's the BIG one: Ireland v. England. The good news? While we know nothing about rugby, we're quick learners. AND, we couldn't think of any more exciting way to spend our first night in Dublin than at a raucous pub, drinking Irish beer and cheering on the guys in green along with a couple hundred excited Irish rugby fans. We rushed to the Arrival Hall in the airport to pick up our pre-purchased Dublin City Pass. Along with giving us a shuttle ride to the City Centre, the pass includes free admission to many of the most popular Dublin city attractions. Within minutes, we were aboard the shuttle and zooming into Dublin on the left side of the road. We wanted to find our hotel first and when we did, in a move that assured me this trip would be smooth sailing all the way through, the Paramount Hotel had our room ready and waiting for us at 9:00 in the morning! The room itself is about the size of the one we had in Zurich in September (which seems large by European standards). The décor is simple and soothing (chocolate and beige), and the bathroom is roomy, bright and clean. Already I knew I would recommend this (affordable) hotel to friends, but the delicious French Toast breakfast we had this morning sealed the deal. Over toast and tea, we plotted our weekend. We have 50 hours in the city... and there is simply TOO much to do. But we can try. Our first stop was Christ Church Cathedral. We enjoyed the brisk walk through the cool Irish morning. Along the way, we made note of several cafes and restaurants we want to try. Given that we only have eight total meals in Dublin, we'll never actually visit ALL of these place. But I can already tell we'll be returning here one day, not only because Dublin is turning out to be a fun city, but because we'll definitely want to see the rest of Ireland. Our Dublin City Pass got us into Christ Church Cathedral, and we took the self-guided pamphlet tour. Grand marble plates engraved with dedications to past reverends and benefactors lined the walls. Natural light reverberated off every stone surface and made the Grand Nave glow. Its Gothic arches form careful patterns in the ceiling and appear to play tricks on the eye, bending and refracting like a reflection in a fun house mirror... but it's no trick. On one side, the towering wall actually does lean backwards by almost a foot and a half, the result of a structural collapse of the opposite wall in the sixteenth century. As we toured, the heavenly sounds of a group of choristers wove through the broad, stony space. Sopranos, altos, tenors, basses... a tapestry of hymn hung in the corridors and put the dazzling stained glass windows to shame. It was only a rehearsal, but we hope to go back and hear a real performance sometime this trip. From the church, we walked to Grafton Street, a shoppers Mecca. Along that thoroughfare, we saw half a dozen street performers scattered about. A tin man, a bronze man, a teen with an electric guitar, a scruffy thirty-something with an acoustic guitar, an accordionist, and a man with a didgeridoo! At the end of the street was a black haired, dark-eyed bagpiper. The thin, nasal strains of his pipe struck up a fast-footed clog dance in the air, matched in speed and finesse only by the piper's long, white fingers as they typed out the tune. 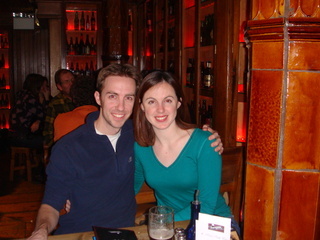 We are staying in the Temple Bar district of Dublin, a ripe, vibrant neighborhood South of the River Liffey. On our walk, we swung through the Temple Bar Food Market. Stalls selling chocolate, cheese, fresh veggies, cuts of meat, kebabs, and pastries peppered the courtyard. A chilly wind wound between the stalls and nudged my hand to zip my coat up to my chin. At one of the stalls, we found the perfect anecdote to the cold: a cup of piping hot cider spiked with apple brandy. Within moments we were warm. Jonathan was lagging by 1:30pm. He'd been up for 24 straight hours and, as much as neither of us wanted to, we knew it was time for a quick nap. Three hours later, we were awakened from the deep, drooling sleep of jetlagged travelers by the preset alarm. It was time for our perfect Dublinesque evening to commence. We walked around the corner to the Porterhouse Brewing Company. Four stories of dining/drinking areas, dark red and amber lighting behind shelves of green, gold and brown beer bottles, an ale mosaic. After hovering for a few minutes, we were fortunate enough to grab a table for two on the third floor near one of the big screen TVs already blasting the pre-game show. The game itself was very exciting. We cheered when the rest of the bar cheered, every time the burly men in the shamrock green jerseys and tight, white shorts did anything. Someday I'll blog about my impressions of rugby itself (this being the only time I've ever watched a whole game), but for now I'll just say I enjoyed it. And that could have been due, at least in part, to the glass of Porterhouse Red stout I downed with my meal. Tomorrow we plan to hit the ground running. There is much to do, much to see. It's the adventure of a lifetime, and we're loving it! To see our pictures, click here .